Kwame Ajamu was just 17 when he was convicted of murder in the killing of a Cleveland money-order salesman. 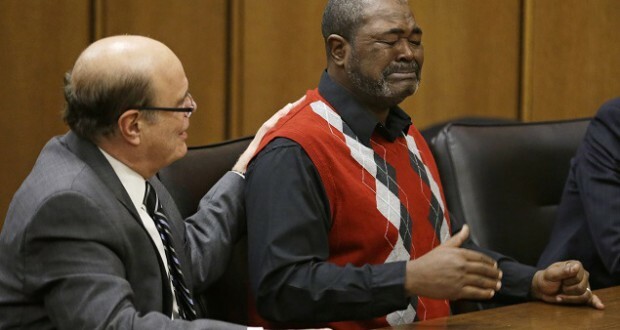 On Tuesday, Ajamu, now 57 and out on parole since 2003, wept after a judge cleared all charges against him. “I’m so happy today that this battle had come to an end,” Ajamu said, according to Reuters. Cuyahoga County Judge Pamela Barker stepped down from her bench to give Ajamu a hug, the Associated Press reported. The case against Amaju, formerly known as Ronnie Bridgeman, began to fall apart after a key witness recanted his testimony decades after the conviction. In 1975, two people had attacked Harold Franks with acid, and one of the people shot him. A third person drove a getaway car. A 12-year-old boy, Eddie Vernon, served as the state’s main witness in the case, and a jury convicted Bridgeman (as he was known at the time), along with his brother Wiley Bridgeman, then 20, and Ricky Jackson, 19. The three were sentenced to death, but their sentences were later commuted. Ajamu was released on parole in 2003 after serving 27 years. A 2011 magazine story delving into what happened on that day in 1975 prompted a new look at the case. Ohio Innocence Project lawyers came to represent the defendants. Last month, Vernon recanted his testimony, saying he was just a boy who wanted to help police and that he didn’t actually see the crime. Instead, he revealed, he was on a bus. In the 1970s, Vernon said, he had provided the names and authorities fed him the other details. In November, a judge freed Jackson, who cried out, “I can’t believe this is over,” the Plain Dealer reported. Jackson served 39 years in prison, the longest sentence served by any defendant who has been exonerated, according to the National Registry of Exonerations.